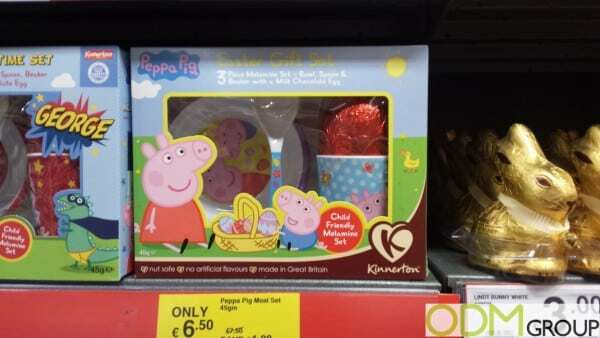 Peppa Pig, the beloved Children’s TV show, has released an Easter Gift Set as an On Pack Promotion in partnership with Kinnerton. Offered as part of this on pack promotion is a child friendly Melamine 3 piece Set. This gift set includes a Bowl, Spoon and Beaker with a Milk Chocolate Egg. On Pack Promotion is a huge favourite for marketers, they are an exceptional way to make your product stand out among the saturated shelves of the standard store. How can On Pack Promotions assist your Marketing Campaign? The other way to influence the costumers is to persuade them directly in the shop. These kind of marketing campaigns are far simpler and can raise sales for as long as the campaign is running. Customer Retention – Perhaps a less obvious benefit, when consumers are delighted with their purchase, they are certainly more likely to return to you as a consumer. Pester Power – An effective on pack promotion utilizes the potential of pester power. Peppa Pig will appeal to children and it is them who will see this on pack promotion, especially one with a gift with purchase, and increase the chance of sale through their childlike negotiation tactics. Cost Effective- These on pack promotions are incredibly cost effective, they can be cheaply produced but the longer term gain will make the venture very useful. Customizability – The higher the customizability of the on pack promotions you offer, the easier you can brand them. Feel free to contact the ODM Group to learn more promotional products or marketing in Japan. We have years of experience sourcing promotional products to companies all across the world. We can provide you with hand fans and a wide range of other products.